+++SAVING OVER £11,000 ON NEW+++Sat Nav with Reverse Camera,Park Sensors,Leisure Battery,Bike Rack,Satellite Aerial & TV Bracket...This particular model is fitted with a 4 metre awning and comes with the "UK Drivers Pack" which includes Cab Air-Conditioning, Cruise Control and Passenger Airbag, Also includes the "Comfort Pack" which has the upgraded Truma 4 Heating and Hot Water System to become a 4E Heating that works on Gas and Electric. Cab seats upholstered in habitation textile and colour and colour coded bumpers.New Sun Living exclusive features including the "hide-away" bathroom which rotates and opens up the kitchen and floor space. Light spacious feeling with spacious dinette and extra interior height at 210 cm. Complimented by deep wall cabinets and cube-form garage compartments, with extra-large doors on both sides. Open plan living with LED lighting for perfect ambiance. 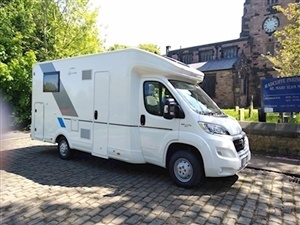 Insulated for year-round use, with Truma heating, heated waste-water tank as standard and smart air-flow ciculation for perfect comfort.This Motorhome is off our rental fleet,Is in excellent condition & has been looked after by ourselves.